On 26 July 1953, Fidel Castro led about 150 men in an attack on Moncada barracks, the strongest garrison of Fulgencio Batista. Batista was Cuba's dictator then, with friendly relations with the US government. Dozens of Castro's men were killed in battle, and Fidel was charged with treason. At his trial, he delivered an impassioned two-hour closing argument that was widely but clandestinely circulated under the title History Will Absolve Me. It was a kangaroo trial, and Castro was sentenced to 15 years in prison, but a public groundswell called out for amnesty, and Castro was released in 1955. After a brief period of exile in Mexico, Castro's triumphant return came in 1959, when his next attempt at revolution succeeded. The brutal Batista government was overthrown, and replaced by the brutal Castro government. History Will Absolve Me was rewritten as a blueprint for Castro's communist regime, and American-owned businesses in Cuba were nationalized. Castro kept many of his promises -- Cubans have free health care, education, and a low level of homelessness, but the society has suffered both from the US embargo and the totalitarian regime. 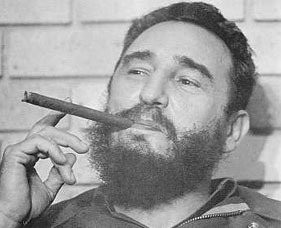 Castro's (and thus Cuba's) relations with the US have always been frigid, but became icy after the US-backed "Bay of Pigs" attempted coup in 1962. To this day, Cubans who travel to America without permission risk forced repatriation, and Americans who travel to Cuba without official US approval risk hefty fines. Castro called himself Prime Minister from 1959-76, and then called himself President, though the change was superficial and he was always utterly autocratic. After intestinal surgery in July 2006, he was rarely seen in public. He temporarily ceded power to his brother, Raúl Castro, on 31 July 2006, and formally stepped down as President on 19 February 2008. Two US Congressmen, Lincoln and Mario Diaz-Balart, are Castro's nephews by his marriage to their aunt, Mirta Diaz-Balart de Nunez. Castro's death was announced by Cuban radio on 25 November, 2016.